PASADENA, California, December 13, 2010 (ENS) – Earth’s largest lakes have been warming during the past 25 years in response to climate change, according to the first comprehensive global survey of temperature trends in major lakes. Researchers Philipp Schneider and Simon Hook of the NASA Jet Propulsion Laboratory in Pasadena, made the discovery using satellite data from 1985-2009 to measure the surface temperatures of 167 large lakes worldwide. The data show far greater warming in the mid- and high latitudes of the Northern Hemisphere than in low latitudes and the southern hemisphere. The largest and most consistent area of warming was northern Europe. The warming trend was slightly weaker in southeastern Europe, around the Black and Caspian seas and Kazakhstan. The warming trends increased slightly farther east in Siberia, Mongolia and northern China. In North America, trends were slightly higher in the southwest United States than in the Great Lakes region. 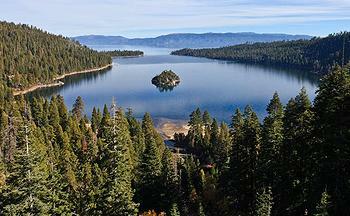 The largest alpine lake in North America, Lake Tahoe, on the California-Nevada border, was one of the primary validation sites for the global lake study. In the Great Lakes and northern Europe, the bodies of water were found to be warming even more quickly than surrounding air temperature. Warming was weaker in the tropics and in the mid-latitudes of the Southern Hemisphere. “The results have implications for lake ecosystems, which can be adversely affected by even small water temperature changes,” Schneider said. Small changes in water temperature can result in algal blooms that can make a lake toxic to fish or result in the introduction of non-native species that change the lake’s natural ecosystem, he explained. The NASA researchers used thermal infrared imagery from National Oceanic and Atmospheric Administration and European Space Agency satellites. Beginning in 1985, surface temperatures were extracted from nighttime thermal infrared imagery of 167 large inland water bodies for the months July through September and January through March. These months were chosen because of the difficulty in collecting data in seasons when lakes are ice-covered or often hidden by clouds. The researchers found an average warming rate of 0.81 degrees Fahrenheit per decade, with some lakes warming as much as 1.8 degrees Fahrenheit per decade. 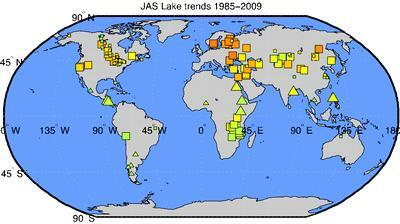 Schneider and Hook selected the study lakes from a global database of lakes and wetlands based on size – typically at least 193 square miles or larger – or other unique characteristics of scientific merit. The selected lakes also had to have large surface areas located away from shorelines, so land influences did not interfere with the measurements. Satellite data were collected from the point farthest from any shoreline. The lake temperature trends largely agreed with trends measured by nine buoys in the Great Lakes, Earth’s largest group of freshwater lakes in terms of total surface area and volume, the NASA researchers said. The temperature trends were also in agreement with independent surface air temperature data from NASA’s Goddard Institute for Space Studies in New York. Schneider and Hook said that their results were consistent with the expected changes associated with global warming.